This statistic shows the moral stance of Americans regarding contraception and birth control in 2018. 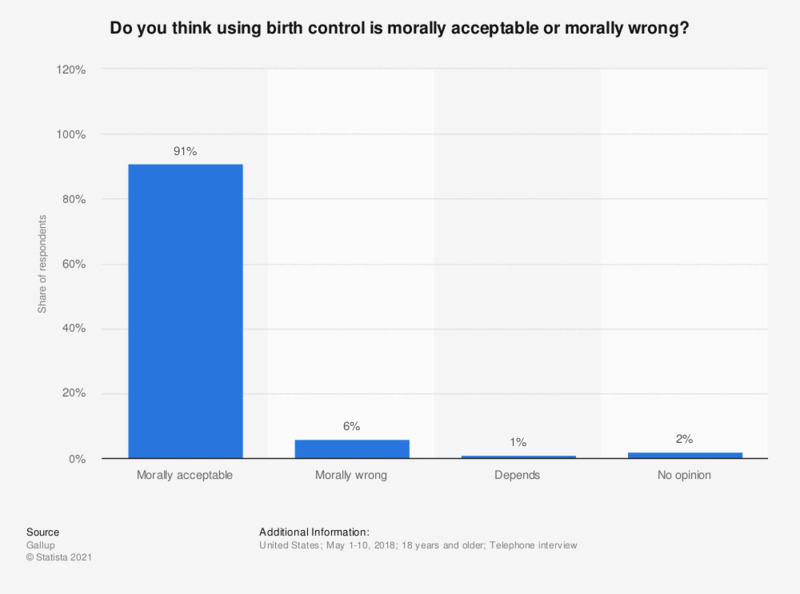 During the survey, 91 percent of respondents stated that they think using birth control is morally acceptable, while 6 percent considered it morally wrong to use contraceptives. Morality is the attempt at defining what is right or wrong about our actions and thoughts. Contraception is one of the more controversial issues and is a frequent topic of heated discussions. In the United States, contraception is widely morally acceptable nowadays, as 89 percent of Americans share this belief, while only 8 percent believe that contraception is morally wrong. This is not surprising, as another survey indicates that between 97 and 100 percent of sexually experienced American women over 15 years used contraception between 2006 and 2010. However, a slightly lower percentage of Catholics support the use of contraceptives. In the United States, there have been a number of lawsuits that oppose the 2010 Affordable Care Act, also known as Obamacare, on the basis of religious grounds and religious freedom, because the Act requires employers to provide health insurance policies that cover and include access to contraception. Further, fifty-five percent of American Catholics believe that religiously-affiliated employers, who desire to be exempt from having to cover contraception in their health plans, should be able to do so. Despite these lawsuits, it is still clear that the majority of people in the U.S. both morally accept and use contraceptives. However, this is not the case across the world; in Pakistan only 12 percent believe that contraceptive use is morally acceptable while 65 percent believe that it is morally wrong. In Nigeria, Ghana, Malaysia and Tunisia acceptance rates are not much higher.